Andra Watkins wrote a novel about Meriwether Lewis, a topic of great interest to her. In an effort to promote the book and commune with the ghost of her main character, Watkins decided to walk the entire Natchez Trace, from Natchez, MS, to Nashville, TN. It was on this trail that Lewis died many years ago. She would break the walk into 15 miles per day, but she would need a wingman to drop her at her starting point each morning and pick her up at the end each day. Her father agreed to take on the role. 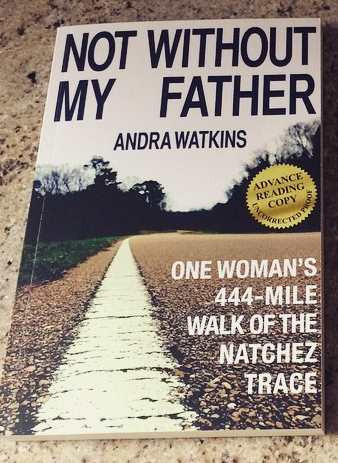 Not Without My Father: One Woman's 444-Mile Walk of the Natchez Trace is Andra Watkins' memoir of her walk, her experiences on the road, and her evolving relationship with her father. Her story is honest and raw at times, lighthearted and whimsical at others. She tells of the physical toll taken on her body as she walks more than 400 miles. But she also shares her thoughts and feelings of communing with those who walked before her on this historic path. Her experience is pretty amazing and made me want to take on something like this ... at least for a fleeting moment! But this is also a memoir about her relationship with her parents, especially her father with whom she has never been close. Their interactions have always been strained, and you could feel how much they drive each other crazy at times. Many of their times together made me laugh out loud. It was also easy to see how much they love each other and want the best for one another. I just love this picture of the two of them in the car! I found this to be a wonderful story of a woman's determination to follow through with her commitment, and to understand and relate to her aging parents in a deeper way. 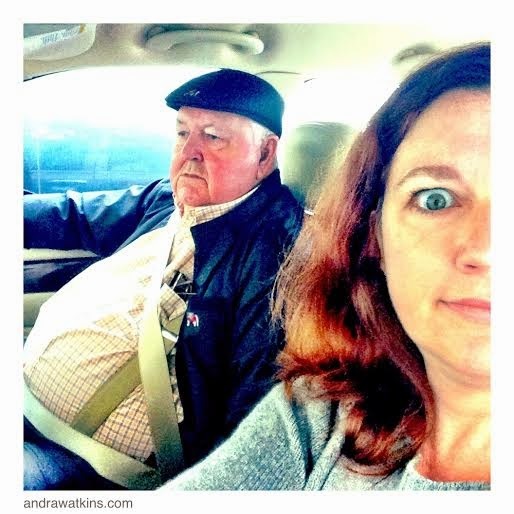 If you enjoy memoirs, I highly recommend Not Without My Father. Connect with Andra Watkins on her website, Facebook and Twitter. This review was written based on a copy of Not Without My Father that I received from Pump Up Your Book in exchange for an honest review. Sounds like a good book. Also, I like your whole blog! I'm a constant reader as well (because I'm a writer). As for the toll the walk took on the author's body, I think it just goes to show why people back in the day looked so old so young. Life is really physically demanding without cars and washing machines and all that! Thank you! I hope you'll continue to visit and read my reviews. I think you're right about life being much more physically demanding back then, although I think people were probably more used to it on a daily basis so wouldn't have thought as much of walking 444 miles as we do today! Interest read! Thanks for sharing this. It was quite interesting. Thanks for stopping by!